Asus doesn’t seem to shy away from suggesting that the Zenbook Pro is its version of Apple’s MacBook Pro. First there’s the design, which Asus specifically describes as “uni-body” (a term Apple uses for the MBP, albeit sans hyphen). The Zenbook Pro is also aluminum, quite thin, and stuffed with powerful hardware, not unlike the MacBook Pro. Oh, and there’s the name, lest the other similarities aren't enough. But one massive difference between this laptop and its Apple equivalent does exist, and it’s one that Apple will never, ever be able to compete with: price. This fully loaded Zenbook Pro not only features massively better specs than the aging 15-inch MacBook Pro, it costs a whopping $1,000 less than a similarly configured model. This system is built to take on other Windows rivals, too—regardless of which similar laptops it goes up against, the Zenbook Pro maintains its standing as a powerful portable at a very reasonable price. Even when compared to the excellent Dell XPS 15 with the exact same specs, the Zenbook is $550 less expensive. Though the Zenbook lacks the je ne sais quoi of the Dell and MacBook by being a bit rough around the edges (more on that later), it still has the slender figure of a true thin-and-light. Although, it’s actually not that light, and it’s quite powerful. In almost every spec, it offers the best-performing part currently available, and cuts almost no corners. Running the show is a Skylake quad-core Core i7-6700HQ CPU with Hyper-Threading, so you get eight logical cores for apps that can use all of them. You also get 16GB of DDR4 memory, support for 802.11ac Wi-Fi and Bluetooth, and a 512GB Samsung SM951 M.2 SSD. The SSD is a PCIe x4 drive that also uses the NVME protocol, so this storage is as next-gen as money can buy these days—especially since this particular SSD model is regarded as one of the fastest. When we ran CrystalDiskMark just for kicks, it hit 1.6GBps in read speeds and 1.3GBps write speeds. Hot damn. The Zenbook Pro can also handle some gaming thanks to its GeForce GTX 960M mobile graphics, although you won’t be able to game at the panel’s native resolution (3840x2160)—compare that to Dell’s XPS 15, which also has a GTX 960M, but paired with a more closely matched 1080p display. Mind you, the 960M part comes with just 2GB of memory. Still, that GPU should be good for modern games at 1080p on Medium settings. Speaking of the display, it’s a gorgeous 4K UHD IPS panel that looks tack-sharp. According to Asus, it covers 100 percent of the sRGB gamut, and 74 percent of the Adobe RGB gamut. It’s a glossy display, however, so it looks best in the dark. In daylight, it can subject you to some gnarly reflections. As a full-sized notebook, the UX501VW features a decent variety of ports that includes three USB 3.0 Type A offering Asus’ Charger+ technology. The company says this allows the ports to charge devices faster than standard USB ports. You also get a single USB Type C port that supports Thunderbolt 3 and USB 3.1, a full-size HDMI port, and an SD/SDXC/MMC card reader. One thing that stood out (and not in a good way) is the label for the Thunderbolt port. Not only does the sticker look like it was cut by hand, but it also looks obviously placed by hand too, because it’s crooked. We don’t expect to see this sort of sloppiness on a flagship product. The Zenbook Pro’s aluminum unibody chassis looks sophisticated and feels quite solid. Sadly, the “one piece of metal” construction precludes easy upgrades, so the bottom of the laptop has precisely zero access panels for RAM, wireless cards, and primary storage. However, if you have the gumption and a torx screwdriver, you could theoretically remove the entire bottom piece and access the hardware. As far as overall size goes, the UX501VW is quite slim, given the amount of horsepower it houses. It’s not quite as thin as the Dell XPS 15 or the Razer Blade, though. The Zenbook Pro is 0.84-inch thick, whereas the XPS is a super-slim 0.66 inch and the Blade is a slightly meatier 0.7 inch. The Zenbook weighs about 5.5 pounds, which is more than a pound heavier than both the XPS 15 (4.12 pounds) and Razer Blade (4.16 pounds). The Zenbook’s 15.6-inch display makes the machine big enough overall to accommodate a spacious, full-sized keyboard complete with number pad. The keys are lit by an adjustable backlight of a purplish hue (or whatever you get when you combine white and blue). It appears the lights are distributed under the keyboard instead of beneath each key, because the effect is strangely uneven, and looks sort of cheap: On the Tab key, for example, the letter “T” is not illuminated at all, but the letters “a” and “b” are. The uneven lighting doesn’t impede legibility at night, but it does obscure the lettering on certain keys during the day. Another oddity is the placement of the power button, which sits at the top-right edge of the number pad. While I never mistakenly pressed it, I could see someone easily doing that. On the whole, the keys are nicely spaced and comfortable. I adapted to the keyboard immediately, and found the key travel and key size pleasant to use. The trackpad is another story. Even though it’s accurate, it felt inexcusably small given all the available real estate. It also seems too close to the keyboard; I wish it extended a bit closer to the edge. While I had no trouble lightly tapping it to register a click, I found that depressing it for a “real” click took undue effort. The area for right-clicking is also surprisingly small—it’s literally just the far-right corner of the trackpad. Luckily, there’s a workaround for that: Just tap two fingers on the trackpad. One of the Zenbook Pro’s most surprising letdowns is its toothless audio system. It doesn’t get very loud and has no mid- or bass tones whatsoever. We’ve heard better sound on much smaller notebooks, so it’s doubly disappointing—and a discredit to its Bang & Olufsen logo, too. With all the hardware that’s stuffed inside this notebook, we wagered the Zenbook Pro would give its competition a tough time. But while its performance mostly met our expectations, it didn’t have the absolutely rock-solid showing we’d hoped for. Let’s dig into the numbers. First we ran Cinebench R15, which measures pure CPU performance. The Zenbook Pro scored slightly behind the Dell XPS 15, but close enough to essentially call it a draw. Dell’s Skylake CPU probably boosted a bit higher. The Zenbook Pro did outpace the Samsung Book 9 Pro, however, which also has the same CPU. None of the other laptops we’ve tested recently can hold a candle to the Skylake notebooks in this benchark, and the Zenbook Pro and the Dell XPS 15 are the fastest we’ve seen thus far. Our Handbrake results looked similar to what we saw in the Cinebench test—a good sign, since some systems’ performance will tank during heavy, extended load on the CPU. In this benchmark, we use Handbrake to transcode a 30GB MKV file into an MP4 using the Android Tablet preset. For notebooks like the Zenbook Pro, Dell XPS 15, and the like, the results indicate how well a system can handle content creation tasks. The Zenbook Pro took about 51 minutes to complete this test, right in line with its nearest rivals. The Dell XPS 15 was slower by a little more than two minutes, and the Samsung Book 9 Pro was slower by about five minutes. It’s safe to say the Zenbook Pro and the XPS 15 are once again very close when it comes to CPU performance. That said, neither time was the fastest we’ve seen for this encode, but laptops that perform faster here are typically much bulkier. Not many people buy a Core i7-equipped machine and think, “I hope this can run Word,” but we run PCMark 8’s Work Conventional benchmark on notebooks like these just to confirm that performance is consistent with other portables in its class. This test runs a combination of office tasks, including video chat, spreadsheet data entry, and web browsing. The Zenbook Pro is a classic example of why we run this test: Given its hardware, it should have torn this benchmark a new one, but its score of 2,738 strangely lags behind its compatriots. Indeed, its performance is more inline with what we’ve seen from Core m systems. It’s perplexing, but the good news is that any system scoring over 2,000 will handle basic tasks like those simulated in this benchmark just fine. You’d be hard pressed to actually feel the difference between the Zenbook Pro and the Dell XPS 15. 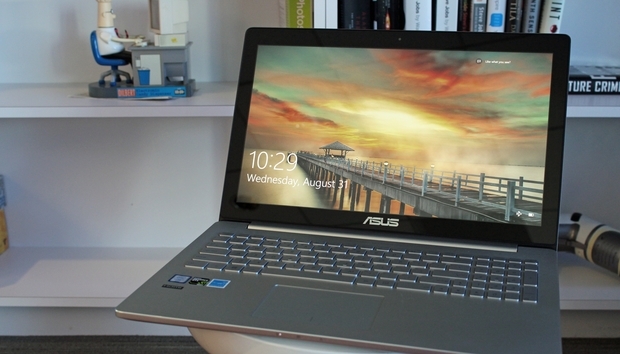 As far as mainstream notebooks go, the Zenbook Pro’s Nvidia GTX 960M GPU isn’t too shabby. It sports 640 CUDA cores and a 128-bit memory bus, along with 2GB of memory. That said, this laptop certainly isn’t a gaming notebook. For fun, we ran Unigine’s Heaven 4.0 at 1080p on Medium settings, and the Zenbook Pro chugged below 30fps the whole time. When we ran our official synthetic test—3DMark’s Sky Diver—it once again trailed slightly behind the Dell XPS 15, despite having the exact same CPU and GPU. Lest you think Dell’s GPU is clocked higher, Both laptops ran at about 1,071MHz. To see if thermal throttling might be an issue, we used Furmark to torture-test the GPU and heat it up. The Zenbook Pro’s 960M began nobly at 1,100MHz, but after a minute dropped down to 975MHz when the GPU reached a toasty 80° C. After several minutes, the clock speed dropped further to 796MHz; eventually it plummeted to 405MHz. Furmark is a torture test, though, and not the real world. When we ran Heaven 4.0 for 30 minutes, the GPU got up to almost 80° C but didn’t throttle at all—it ran at a respectable 1,085MHz the whole time. So while Furmark gives a potential clue as to what’s causing the discrepancy in performance between this Zenbook Pro and the Dell XPS 15, it’s by no means definitive. In the battery department, the Zenbook Pro sports a fat 96 watt-hour battery. That’s bigger than the largest battery you can get with the Dell XPS 15, which tops out at 84Whr, but it’s still a touch smaller than the behemoth 99.4Whr battery in the Macbook Pro. Just know that with a battery this large, it takes over two hours to charge it from five percent back to 100. Our first round of testing had the Zenbook Pro coming in below Asus’ advertised claim of six hours. The test consists of playing a 4K video file on a loop in Windows 10’s Movies and TV app with the screen brightness set between 250 nits and 260 nits until the battery runs down; the Zenbook Pro lasted 5 hours, 24 minutes. That was a puzzling result, considering the massive size of the battery and the fact that the Razer Blade managed over six hours in the same test with a smaller, 70Whr battery. Sure, the Zenbook Pro has a 4K panel with touch, which is battery draining, but the Razer Blade is similarly configured. After reaching out to Asus, we received a second unit. In our tests on that machine, the Zenbook Pro showed an improved runtime of 6 hours, 21 minutes. That’s a little more appropriate, so it’s possible that our first unit had a defect. On paper, the Zenbook Pro is an incredible deal. It features some extremely high-end parts, yet is amazingly affordable compared to its competitors. After spending time with it, however, it becomes clear why it’s less expensive, particularly when compared to the Dell XPS 15 with the exact same specs. The Zenbook Pro’s performance is slightly weaker, and it has subpar speakers and little oddities like uneven keyboard backlighting and that slap-dash Thunderbolt sticker. That doesn’t make the Zenbook Pro a terrible notebook by any stretch. As it stands, it’s still more powerful than the majority of notebooks on the market. If you can live with its faults, you’ll likely be a happy camper.